Someone asked me to share this recipe because their Vegan Cookies book went missing (so they say!) I figured why not just put it here for the world? A crispy coconutty outside and moist sweet inside. That sounds good, right? Well, what if we told you it’s also dipped in chocolate? These are irresistibly adorable, nugget sized morsels that look like they could double as the currency of magical forest creatures. A touch of almond extract really brings out the coconut. For variety, try the cocoa variation and have a double chocolate extravaganza. 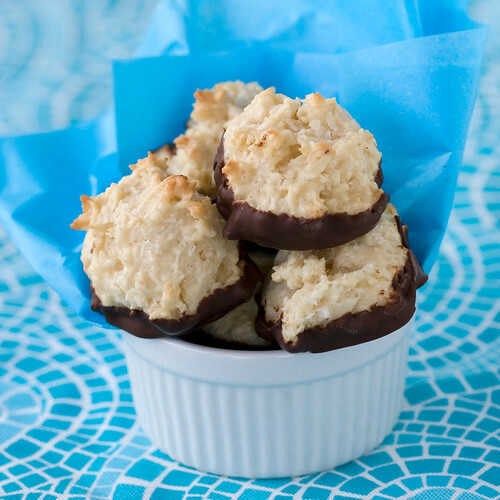 Cocoa Macaroon Cookies: Replace 1/4 cup of flour with 1/4 cup unsweetened cocoa. Or try any combination above! Puree tofu, oil and milk in a blender or food processor until smooth, scraping down the sides with a spatula to make sure you get everything. Transfer to a mixing bowl. Mix in the sugar and extracts. Mix in flour, baking powder and salt until well incorporated. Mix in coconut until a stiff dough forms. Drop cookies by the tablespoon onto cookie sheet 2 inches apart from each other, they don’t spread much at all. Don’t smooth the tops out, it’s cool if they have some pieces of coconut sticking out to get a little browned. Bake for 12 to 14 minutes, the bottoms should be lightly browned and the tops just barely flecked with color in a few spots. Let cool on sheets for 2 minutes or so, then transfer to cooling racks to cool completely. In the mean time, melt the chocolate. Line a cutting board with parchment paper (it’s fine to reuse the stuff you lined the sheets with). When cookies have cooled completely, dip the bottoms in chocolate and set chocolate side down on the parchment paper. Place in fridge to set for at least 15 minutes. Keep stored in a tightly sealed container at room temperature. If it’s hot out, keep in the fridge so the chocolate doesn’t melt. i just made a double batch of these- because the one batch i made two weeks ago didn’t make it to dinner for our dinner party! i like to dip the bottoms in chocolate, then crushed pistachios. try it. it is amazing!!! is the almond extract necessary? or is it a strong presence in the cookie? because anything marzipan-y makes me feel nauseous, so i usually leave it out if i can, unless it will be undetected. any suggestions? thanks!! Could these be made gluten free? What a cool way to make macaroons! And I never knew that you could bring out the coconut flavor with almond extract. Since I’m a huge coconut fan, that sounds perfect! Tae – I share your dislike of almond extract – I can’t stand it either. I usually just leave it out of most recipes that call for it, and they generally turn out fine. You could also, if you want, add a little of some other extract that you do like, or some other flavouring like the orange zest she suggests in one of the variations. Sometimes recipes use a small bit of almond extract just to give the flavour a bit more zing, and I find citrus usually substitutes pretty well for that – a little bit of lemon or orange, either extract or zest. But you could experiment with other flavours too. Yeah, totally. I love a hint of almond with coconut, but you could use coconut extract or vanilla. Isa…I’ve been stalking your site for a while now. I own Veganomicon, Appetite for Reduction, and plan on owning everything You’ve ever written you Culinary Genius YOU! 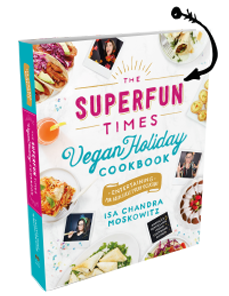 At the Risk of sounding like, well, a crazy stalker, I just want you to know that I LOVE YOUR RECIPES, and my family fell in love with you ever since I discovered Veganomicon about 3 years ago. Now that I’m a Vegan myself (and with food like yours, why isn’t everyone? ), your recipes make up the majority of our meals at home. THANK YOU SO MUCH for sharing your gift with the world! Another winner! These came out great. I’ve been a fan for a while, but these cookies prompted me to comment–they are totally awesome! I’ve made them several times in the past month alone to give to friends, family, and office mates. Always a hit! I’m whipping up a batch right now, actually; this time, I’ve put an Indian-inspired twist on them. I added nutmeg, allspice, cinnamon, and cardamom to the cookie batter, and I am going to dip them into cayenne-spiced chocolate. Dusted with ginger powder, I think they’ll go fantastically with tonight’s Indian feast! Do these macaroons freeze well? I wanted to save some for later. I made the chocolate variation as described in Vegan Cookies. They’re yum! I’m taking them to a scout meeting tonight, full of hungry teenage boys, so that’ll be the real test. However shredded coconut here is much…bigger? Like longer bits? So they don’t look as dainty and pretty as those pictured. Oh well! I made these last night for Valentine’s and they came out PERFECT! All I could find was sweetened coconut and “lite” firm silken tofu, but they still tasted great. I just cut back a tiny bit on the sugar to make up for the coconut. They look just like the picture and they’re the perfect treat. Oh, and I omitted the almond extract because my valentine has a nut allergy and I was scared. Still great! TROUBLE!! I made the orange variation just now, and yum! Cant stop eating them. Will make another batch to bring to our Passover seder next week. Thank you so much for sharing this!! I made a Passover version – subbed matzah cake meal & potato starch for the flour. Turned out great! I just made these after putting it off since I saw the recipe in December. Delicious! I baked half with an almond pressed onto the top so they would be like Almond Joys. I’ve never had a macaroon–are they supposed to be light and crispy or more solid with just the outside crispy? Is there a way to replace tofu in the recipe and still keep it awesome? love these! i made them for my family’s passover seder last night, and everyone loved them! thanks isa! Could I use coconut rather than canola oil? Its what I have on hand, ..and might be yummy! Do you think these would be horrible without the oil? The rest of the ingredients give me hope that they wouldn’t be bad the way most oil-free cookies I’ve tried to make have turned out (flat muffins really) I’m trying not to completely leap off the oil-free wagon this year – thanks! I also made a double batch. with cocoa and white chocolate dip. Amazing amazing!! Thank you for the recipe. I’ve shared it on my blog and gave you credits. Sadness ensues as I realize these aren’t kosher for Passover. Can this be made gluten free? what type of flour would you recommend? How to SUBSTITUTE TOFU for someone allergic to soy? Do your thing and then sprinkle a little more chai spice on top before you chill them, BAM delish chai spice macaroons. Do u have any nutritional Info like Sugars , carbs? I gotta favorite this web site it seems extremely helpful handy. I just made these beauts for a holiday party with crushed candycane in the batter AND on the chocolate bottom. HIGHLY RECOMMEND. Are you encountering associate degree email be tallied once this web site page; I apart from am a blogger, that I had a requirement to understand your circumstance; most folks expertise the sick effects of some satisfactorywireless ways in which, and along you’d would like to figure procedures with others, you’d would like to impact coniferous tree specific A whenever enclosed. Please i want to acknowledge on the off likelihood that you simply square measure captivated by A drive on your knowledge handling framework. You involve a number of unfathomable substance, that i really trust i’d merely be a pleasant assets. ought to anybody ever before ought to have a couple of weight off, i want to scribble down a number of materials in your calculation machine in modification for an online connect another time to mine. If it isn’t an excessive amount of hassle image coniferous tree specific a contact whenever enclosed. a lot of obligated tons.